When I decided to start drawing doodles for this blog, I swore to myself that I’d never go back and revise any of them… I’d try to be all philosophical about it, and just let the flaws be… but every time I Google for photos of “Meredith MacNeill”, this blog (and the lame picture I drew) is one of the top hits. 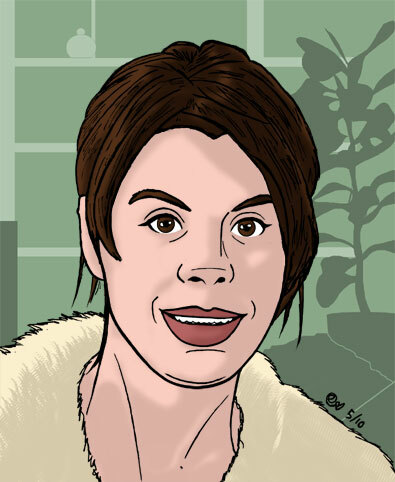 In my defence, there aren’t many decent-sized reference photos to work from… but since I drew the old one, I’ve been able to grab some screen-caps from her appearance on Peep Show, and finally caved to my niggling desire to knock up a more flattering replacement. Not that it really matters to anyone else, I know, but at least I’ll feel slightly less embarrassed the next time I run a search. This entry was posted in Rants about TV and tagged Meredith MacNeill, Peep Show. Bookmark the permalink. omgI had noticed the pictures on your vox, but I thought they were from somewhere official. *you* drew these?? ?I am utterly impressed.